Here are three examples of where it can go wrong. Take note - these are not extreme examples, but are all too common! Yes, it can live on steel. High humidity within the building can result in peeling paint, rust and mold/mildew on surfaces, as you can see in this photograph. No matter how many times they painted it, the paint peeled and the steel rusted. Patches of mold were also noted on the paint and the steel. Mold can't eat steel but with enough moisture and air currents to bring it food, it was surviving twelve stories in the air! This was a glass roof atrium in a building with million dollar condos. They pumped unconditioned air into the atrium and VOILA! Note the edge of the door. An imbalance in the air pressure caused by the mechanical system was drawing warm moist air into this room where it cooled and the moisture condensed, causing mold growth. In addition, this warm, moist air created comfort problems for the occupants. The air conditioner couldn't maintain the proper temperature and the humidity was high. It made for a very uncomfortable environment. But the problem was not with the air conditioner that served this space - it was with the make up air system and the exhaust system that served the entire structure. There was an imbalance between the systems. The only one benefiting from this set up was the mold. What! There's a difference in filters??? The occupants of this building were breathing the air that passed through this coil and blower. 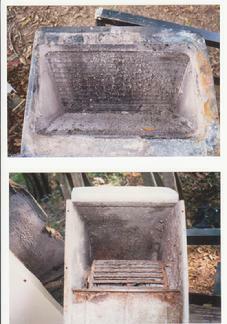 Poor filtration had doomed the equipment. The use of .50 cent grocery store filters in a skilled nursing facility resulted in compromising the air conditioning equipment and the indoor environment. Both staff and residents experienced uncomfortable temperatures and humidity levels. Odors also became an issue due to lack of proper air flow and the humidity. The cost to replace just one of the large air handlers was more than several years worth of quality filtration would have cost for the whole building.